Frozen Shoulder, clinically known as Adhesive Capsulitis, is a condition where the capsule of the shoulder’s ball-and-socket joint becomes tight & restricted (hence the description as “frozen”). Subsequently, movement of the shoulder/arm is limited and painful. What Tissues Are Affected With This Condition? “Freezing” of the shoulder is caused by a tightening of the joint capsule. This capsule serves to increase shoulder joint stability normally, but a frozen shoulder develops when this capsule becomes excessively restrictive, hence the limitation to shoulder joint movement. Research has actually disproved the long held belief that capsular “adhesions” actually develop, with research now pointing more towards the development of additional blood vessels, connective tissue, & the possible subsequent thickening of this connective tissue. Who Is Susceptible To Developing A Frozen Shoulder? A frozen shoulder typically presents in those above 40 year of age, with women more likely than men to develop this condition. What Causes A Frozen Shoulder? There can be many causes of a frozen shoulder, including localised trauma, and immobility of the arm (post fracture, stroke, mastectomy etc.). Proposed predisposing underlying medical causes include diabetes, thyroid problems, & tuberculosis. How Does A Frozen Shoulder Present? A frozen shoulder presents in 3 phases. During the “freezing phase” range of motion begins to become restricted, with pain presenting on normal daily activities. Symptoms peak during the “frozen phase”, with movement restriction at its worse. Both movement restriction and pain gradually improve as the patient enters the “thawing phase. Patients suffering from a frozen shoulder will present with a typical pattern of movement restriction. While lifting the arm upwards to the front and side will prove problematic, while rotational movements will also prove notably problematic. Functionally, patients presenting with a frozen shoulder will report consistent restrictions to certain functional tasks. These tasks typically include combing of hair or using a hairdryer, reaching to put the arm into a jacket sleeve, the fastening on a bra, & passing a belt around ones waist. Patient also struggle to lie on the painful side at night. 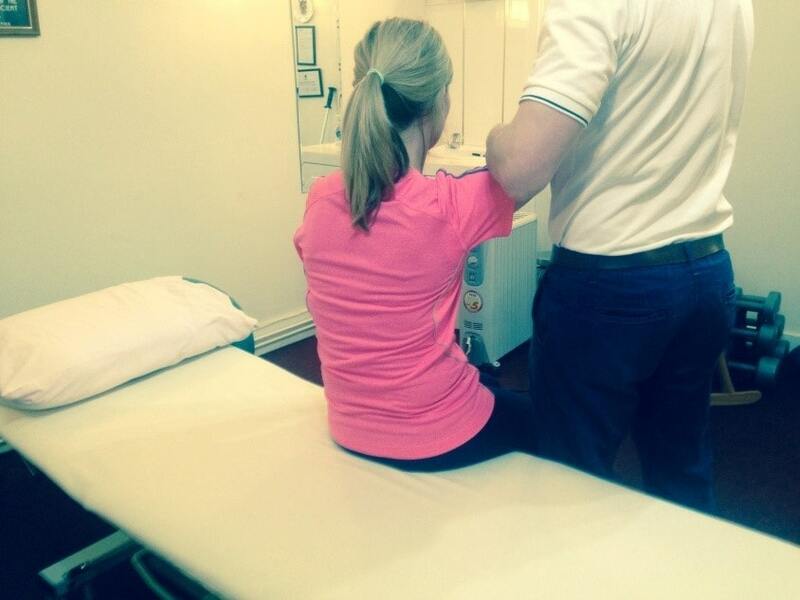 What Is The Recovery Timescale For A Frozen Shoulder? Frozen Shoulder is generally a self-limiting condition, meaning it will naturally resolve itself, in time, without any treatment. Physiotherapy serves to considerably speed up this recovery process however. There exists a huge variance between individuals with regard to the overall time frame for frozen shoulder. Generally, the condition can last anywhere from several months to several years if untreated. With physiotherapy, the overall course of the acute shoulder can typically be reduced to anywhere from several weeks to several months, with minimal symptoms often lingering for some time afterwards, although full function has been regained & pain reduced to a minimum. What Can I Do To Help This Condition Myself? Maintaining good posture is also advisable, to allow for more optimal shoulder movement, and to reduce further joint irritation which can occur due to poor positioning. Shoulder surgery is a last option with patients, and something none of our patients at K.M. Woods Physiotherapy have had to resort to. Surgery, which involves incision of the thickened capsule to release its tightness via keyhole approach, is immediately effective, but requires a sustained period of post-operative physiotherapy and rehabilitation to maintain its benefits. I have had a lot of physiotherapy over the years, but the quality of service and care here is outstanding!